Comments on "Haidee Findlay-Levin, Stylist, Manhattan"
She definately has her OWN style, but it's not for me. That top is too garbage-y for me. But the glasses are great. Great photo, and I really love those large-frame glasses on her. I think we are going to see more of them! How much longer will you be in NY for? 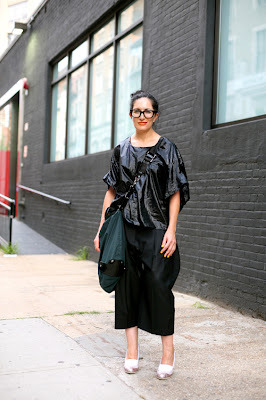 I love seeing the new trash-bag style taken from the runway to the street. This is very strange, I love how dark it is, yet not at all gothic to me. She is quite interesting... I wonder if those glasses are fake. I wish I could see her shoes more clearly, it would give me a total view of her look... I do however like the look, just a shoe whore is all! I'm sure she does fantastic work but this reminds me of leftovers from that Missy Elliott video. Sorry. She is indeed beautiful. I love her glasses. The skirt and shoes and bag all look good. The top seems to have a more than passing resemblance to a Hefty Bag. I love when all black outfits are made interesting with plays on textures and surface appeal like this one. She looks like she put together this outfit using items found in the cleaning product aisle of her local bodega. far from all the comparisons to garbage bags and whatnot, this look is pretty fresh to me..and i applaud her for her style..i really love the patent top actually.and the shoes..they look tad familiar..ysl? This really is something I had never seen before.. I wouldn´t say I like it but it certanley is original. Has anyone noticed the yellow painted nails??? Talk about innovation! I'm sorry, she looks totally amazing, right-on and avant garde. Looks like the top probably moves like a lightweight, diapanous silk/nylon blend thing. All dark with white shoes - great color barrier-breaking look for summer. Ultra sophisticated, yet not pretentions which is very hard to achieve. I want to be her. Does anyone know whos bag that is? I want one. here glasses are indeed real. she's been wearing glasses from since a very young age. Beautiful and have a great imagination. Thanks!